Mount Çika (Albanian: Mali i Çikës) is a mountain in the south-western region of Albania bordering the Ionian Sea. The highest peaks of Çika are Maja e Çikës, the highest peak of the Ceraunian Range, standing at 2,044m above sea level and Maja e Qorrës at 2,018m. Since the mountain is situated bordering the Ionian sea, it appears to be very high as it begins to rise at sea level(0m). The northern part of Çika is part of Llogara National Park. The port city of Vlora is 40 km north-west of Çika. On the peaks of Çika mountain there is a magnificent view of the northern Ionian Islands as well as the Italian coast of Puglia (Otranto). On the foot of the western side of the mountain there are small beaches which attract tourists during the summer months. These beaches include: Himarë, Palasa, Dhermi and Jala. 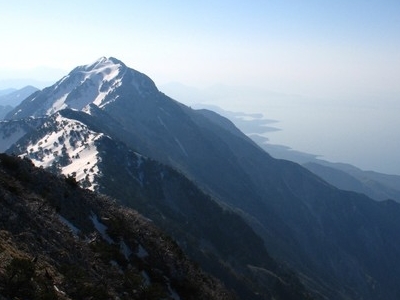 Here's the our members favorite photos of "Peaks or Summits in Albania". Upload your photo of Mount Çika!